I receive lots of compliments from my shows, but it’s not every day that someone goes out of their way to mail me a wonderful thank-you letter and share a photo from my appearance at their party. Thank you, Linnea and Sofia! “We were thrilled with the magic show Jeff Evans performed for our daughter’s 7th birthday party. 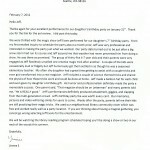 From my first e-mailed inquiry to schedule the party about a month prior, Jeff was very professional and interested in making the party just what we wanted. Our party date turned out to be just after a big snow storm had run its course and Jeff assured me that weather had never prevented him from doing a show. He was there as promised. “The group of thirty-five 4 – 7 years old and their parents were very engaged as Jeff flawlessly unveiled one creative magic trick after another. A couple of the kids were occasionally loud or fidgety but Jeff humorously got them settled in as though e was a seasoned elementary teacher. My often shy daughter had a great time getting to assist with a couple tricks and eve got transformed into a real magician. Jeff included a couple of science themed tricks and share the physics of how those tricks work and could be done at home. “Jeff’s performances definitely produced amazement, giggles, and clapping from the multi-generational crowd. Jeff’s birthday party fee was worth every cent. Our memories, pictures and video will bring smiles for years to come. Weeks after the party, parents tell me their kids are still practicing their magic tricks. We used our neighborhood library community room which was free and worked really well as a party location. If you are thinking about having a magical gathering, you cannot go wrong selecting Jeff Evans for the entertainment. “We will be watching the library reading program schedules hoping you’ll be doing a show or two in our neck of the woods this summer. Learn more about my magic shows for kid’s birthday parties at www.mymagicparty.com or send e-mail to jeff@amazementproductions.com. 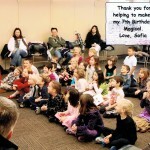 This entry was posted in Uncategorized and tagged birthday party, magic show, magician, Seattle, Seattle magician. birthday party magician. Bookmark the permalink.